Located in the protected sanctuary of Sulu Sea, Lankayan Island resort is a private island paradise offering tranquility, pristine white sand beaches and stunning sunsets. Sea front chalets wait in front of the amazing beach of the resort. The island prides itself in being the home of Hawksbill and Green turtles. These turtles nest the beaches of the island from June to September. Just a short boat ride from the resort is another sanctuary offering other unique opportunities to witness Orangutan. Large aquatic creatures such as Giant Grouper, Sting Ray and Leopard shark inhibit the waters of surrounding reefs near the resort. Lush coral conditions make a very good place to witness macro marine organisms. The resort offers macro diving, which rivals near islands of Kapalai and Mabul. There are sightings of whale sharks in the period from March to May. 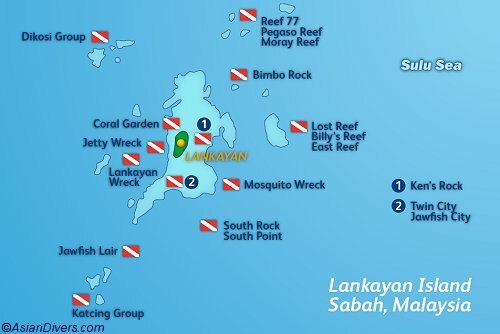 Among all the many different dive spots near the resort is its biggest pride, the Lankayan Wreck. This shipwreck houses some of the rarest fish species such as the glass fish, painted frogfish, giant grouper, and Harlequin phantom pipe fish.